You will get all the ingredients for my steak pie below. I prefer to cut the beef into smaller chunks, taking out the stringy fat. Put two OXO cubes into a measuring jug and add half a litre of boiling water. Using browning is not essential but does add a certain luxurious dark brown colour to the gravy. Cook the beef chunks on a hob on a low heat for at least 2 hours stirring every so often. Check your gravy does not reduce too much​, pour 50ml of HP sauce into your gravy mix, this will add a certain bite to your gravy. 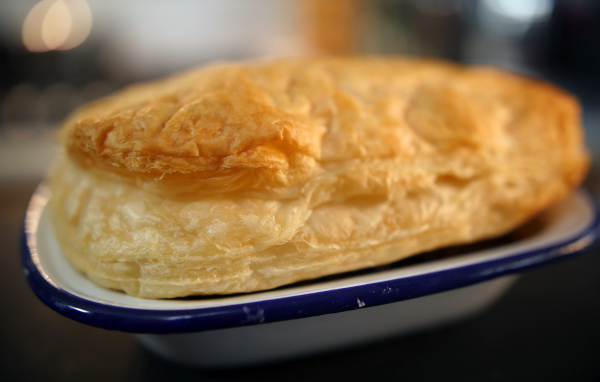 About 15 minutes before your steak pie meat is ready you can prepare the puff pastry. Cut out the puff pastry and cook in a hot oven (180°) for about 10 minutes or until the pastry rises in the oven and turns golden brown.